WARNING: This section contains links to document files that may be covered by copyright. You may browse them at your convenience (in the same spirit as you may read a journal or a proceeding article in a public library). Retrieving, copying, or distributing these files, however, may violate the copyright protection law. We recommend that the user abides international law in accessing this directory. Murugappan Senthilvelan, Meng Yu, Daniel Iancu, Mihai Sima, and Michael Schulte, "LDPC Decoding on the Sandbridge Sandblaster SDR Platform," SDR Forum Technical Conference and Product Exposition (SDR 2010), Washington, DC, November-December 2010. Murugappan Senthilvelan, Javier Hormigo, Joon Hwa Chun, Mihai Sima, Daniel Iancu, Michael Schulte, and John Glossner, "CORDIC-Based LMMSE Equalizer for Software Defined Radio," Proceedings of the 10th International Conference on Embedded Computer Systems: Architectures, MOdeling and Simulation (SAMOS 2010), Samos, Greece, July 2010. Murugappan Senthilvelan, Mihai Sima, Daniel Iancu, Javier Hormigo, and Michael Schulte, "CORDIC Instruction Set Extensions for Matrix Decompositions on Software Defined Radio Processors," The 43rd Annual Asilomar Conference on Signals, Systems, and Computers (Asilomar 2009), Pacific Grove, California, U.S.A., November 2009. Mihai Sima, Michael McGuire, and Scott Miller, "Reconfigurable Array for Transcendental Functions Calculation," IEEE International Conference on Field-Programmable Technology (ICFPT 2008), pp. 49-56, Taipei, Taiwan, December 2008. Scott Miller, Mihai Sima, and Michael McGuire, "Transcedental Functions on a Shift-Enabled Reconfigurable Device: CORDIC as a Case-Study," The 42nd Annual Asilomar Conference on Signals, Systems, and Computers (Asilomar 2008), Pacific Grove, California, U.S.A., October 2008. Michael McGuire and Mihai Sima, "Detection of Block-Spread OFDM in Fast Fading," The 14th Asia-Pacific Conference on Communications (APCC 2008), pp. 1-5, Akihabara, Tokio, Japan, October 2008. Scott Miller, Ambrose Chu, Mihai Sima, and Michael McGuire, "VLSI Implementation of a Cryptography-Oriented Reconfigurable Array," 11th Euromicro Conference on Digital System Design Architectures, Methods and Tools (DSD 2008), pp. 575-583, Parma, Italy, September 2008. Eugene Hyun, Michael McGuire, and Mihai Sima, "RadLoco: A Rapid and Low Cost Indoor Location-Sensing System," The Third ICST International Conference on Communications and Networking in China (CHINACOM 2008), pp. 630-634, Hangzhou, P.R. China, August 2008. Scott Miller, Mihai Sima, and Michael McGuire, "VLSI Implementation of a Shift-Enabled Reconfigurable Array," IEEE International Symposium on Circuits and Systems (ISCAS 2008), pp. 1360-1363, Seattle, Washington, U.S.A., May 2008. Ambrose Chu, Scott Miller, and Mihai Sima, "Reconfigurable Solutions for Very-Long Arithmetic with Applications in Cryptography," The 18th ACM/SIGDA Great Lakes Symposium on VLSI (GLSVLSI 2008), pp. 59-64, Orlando, Florida, U.S.A., May 2008. John Glossner, Daniel Iancu, Mayan Moudgill, Sanjay Jinturkar, Gary Nacer, Stuart Stanley, Andrei Iancu, Hua Ye, Michael Schulte, Mihai Sima, Tomas Palenik, Peter Farkas, Jarmo Takala, "Implementing Communications Systems on an SDR SoC," The International Conference on Acoustics, Speech, and Signal Processing (ICASSP 2008), pp.~5380--5383, Las Vegas, Nevada, U.S.A., March-April 2008. Mihai Sima, Michael McGuire, "Embedded Reconfigurable Solution for OFDM Detection over Fast Fading Radio Channels," IEEE Workshop on Signal Processing Systems (SiPS 2007), pp. 13-18, Shanghai, China, October 2007. Mihai Sima, Murugappan Senthilvelan, Daniel Iancu, John Glossner, Mayan Moudgill, and Michael Schulte, "Software Solutions for Converting a MIMO-OFDM Channel into Multiple SISO-OFDM Channels," 3rd IEEE International Conference on Wireless and Mobile Computing, Networking and Communications (WiMOB 2007), Paper No. 9 (8 pages), White Plains, New York, U.S.A., October 2007. Scott Miller, Mihai Sima, and Michael McGuire, "Alternatives in Designing Level-Restoring Buffers for Interconnection Networks in Field-Programmable Gate Arrays," 10th Euromicro Conference on Digital System Design Architectures, Methods and Tools (DSD 2007), pp. 138-146, Lübeck, Germany, August 2007. Michael McGuire, Eugene Hyun, and Mihai Sima, "Location Aware Computing for Academic Environments," Mobile Content Quality of Experience Workshop (MobConQoE 2007) held in conjunction with the Forth International Conference on Heterogeneous Networking for Quality, Reliability, Security and Robustness (Qshine 2007), Vancouver, BC, Canada, August 2007. Michael McGuire, Mihai Sima, "Block-wise Parallel Detection for OFDM with Fast Fading," 15th International Conference on Digital Signal Processing (DSP 2007), pp. 359-362, Cardiff, Wales, UK, July 2007. Daniel Iancu, Hua Ye, Murugappan Senthilvelan, Vladimir Kotlyar, John Glossner, Mayan Moudgill, Sitij Agrawal, Sanjay Jinturkar, Andrei Iancu, Vaidyanathan Ramadurai, Gary Nacer, Stuart Stanley, Mihai Sima, and Jarmo Takala, "Hand held analog television over WiMAX executed in SW," IS&T/SPIE 19th Annual Symposium on Electronic Imaging, Science, and Technology (EI07), Multimedia on Mobile Devices II Section, Volume 6507, San Jose, California, U.S.A., January 2007. Suman Mamidi, Michael Schulte, Zaipeng Xie, Mihai Sima, Daniel Iancu, John Glossner, "Arithmetic Units for Software Defined Radio," 40th Annual Asilomar Conference on Signals, Systems, and Computers (ASILOMAR 2006), pp. 341-346, Pacific Grove, California, October-November 2006. Ambrose Chu, Mihai Sima, "Reconfigurable RSA Cryptography for Embedded Devices", The 19th IEEE Annual Canadian Conference on Electrical and Computer Engineering (CCECE 2006), pp. 1560-1563, Ottawa, Canada, May 2006. Eugene Hyun, Mihai Sima, Michael McGuire, "Reconfigurable Implementation of Wavelet Transform on an FPGA-augmented NIOS Processor", The 19th IEEE Annual Canadian Conference on Electrical and Computer Engineering (CCECE 2006), pp. 595-598, Ottawa, Canada, May 2006. Mihai Sima, Daniel Iancu, John Glossner, Michael Schulte, Suman Mamidi, "Software-Based Geometry Operations for 3D Computer Graphics," IS&T/SPIE 18th Annual Symposium on Electronic Imaging, Science, and Technology (EI06), Multimedia on Mobile Devices II Section, Volume 6074, pp. B1-B9, San Jose, California, U.S.A., January 2006. Mihai Sima, Michael McGuire, Daniel Iancu, John Glossner, "CORDIC Scenario for Kalman-based Channel Estimation," Proceedings of the IEEE Pacific Rim Conference on Communications, Computers and Signal Processing (PacRim 2005), pp. 165-168, Victoria, BC, Canada, August 2005. Michael McGuire, Mihai Sima, "Low Order Kalman Filters for Channel Estimation," Proceedings of the IEEE Pacific Rim Conference on Communications, Computers and Signal Processing (PacRim 2005), pp. 352-355, Victoria, BC, Canada, August 2005. Mihai Sima, John Glossner, Daniel Iancu, Hua Ye, Andrei Iancu, Joseph Hoane, "CORDIC-Augmented Sandbridge Processor for Channel Equalization," Proceedings of the 5th Workshop on System Architecture MOdeling and Simulation (SAMOS 2005), Springer-Verlag, Lecture Notes in Computer Science (LNCS), Vol. 3553, pp. 152-161, Samos, Greece, July 2005. Mihai Sima, Stamatis Vassiliadis, Sorin Cotofana, Jos T.J. van Eijndhoven, "Color Space Conversion for MPEG Decoding on FPGA-augmented TriMedia Processor," Proceedings of the 14th IEEE International Conference on Application-specific Systems, Architectures, and Processors (ASAP 2003), IEEE Computer Society Press, pp. 250-259, The Hague, The Netherlands, June 24-26, 2003. Jari Nikara, Stamatis Vassiliadis, Jarmo Takala, Mihai Sima, Petri Liuha, "Parallel Multiple-Symbol Variable-Length Decoding," Proceedings of the International Conference on Computer Design (ICCD 2002), IEEE Computer Society Press, pp. 126-131, Freiburg, Germany, September 2002. Mihai Sima, Stamatis Vassiliadis, Sorin Cotofana, Jos T.J. van Eijndhoven, Kees A. Vissers, "Field-Programmable Custom Computing Machines. A Taxonomy," Proceedings of the 12th International Conference on Field-Programmable Logic and Applications (FPL 2002), Springer-Verlag, Lecture Notes in Computer Science (LNCS), Vol. 2438, pp. 79-88, Montpellier, France, September 2002. Mihai Sima, Evert-Jan Pol, Jos T.J. van Eijndhoven, Sorin Cotofana, Stamatis Vassiliadis, "Entropy Decoding on TriMedia/CPU64," Proceedings of the 2nd Workshop on System Architecture MOdeling and Simulation (SAMOS 2002), STW Press, Samos, Greece, July 2002. Mihai Sima, Sorin Cotofana, Stamatis Vassiliadis, Jos T.J. van Eijndhoven, Kees A. Vissers, "MPEG-compliant Entropy Decoding on FPGA-augmented TriMedia/CPU64," Proceedings of the 10th Annual IEEE Symposium on Field-Programmable Custom Computing Machines (FCCM 2002), /www.fccm.org/">FCCM 2002), pp. 261-270, IEEE Computer Society Press, Napa Valley, California, April 2002. Mihai Sima, Sorin Cotofana, Stamatis Vassiliadis, Jos T.J. van Eijndhoven, Kees A. Vissers, "MPEG Macroblock Parsing and Pel Reconstruction on an FPGA-augmented TriMedia Processor," Proceedings of the International Conference on Computer Design (ICCD 2001), pp. 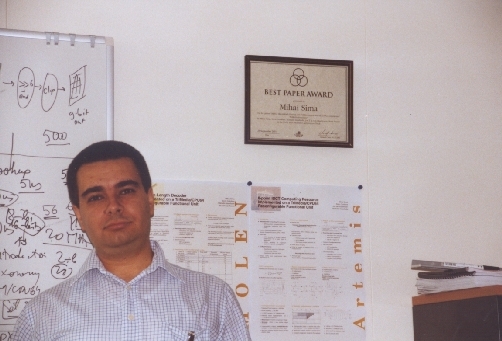 425-430, IEEE Computer Society Press, Austin, Texas, U.S.A., September 2001, Best Paper Award. Mihai Sima, Sorin Cotofana, Stamatis Vassiliadis, Jos T.J. van Eijndhoven, Kees A. Vissers, "A Reconfigurable Functional Unit for TriMedia/CPU64. A Case Study," Proceedings of the Workshop on System Architecture MOdeling and Simulation (SAMOS 2001). Embedded Processor Design Challenges, Springer-Verlag, Lecture Notes in Computer Science (LNCS), Vol. 2268, pp. 224-241, Samos, Greece, July 2001. Mihai Sima, Sorin Cotofana, Jos T.J. van Eijndhoven, Stamatis Vassiliadis, Kees A. Vissers, "An 8x8 IDCT Implementation on an FPGA-augmented TriMedia," Proceedings of the 9th Annual IEEE Symposium on Field-Programmable Custom Computing Machines (FCCM 2001), pp. 160-169, IEEE Computer Society Press, Rohnert Park, California, U.S.A., April-May 2001. Mihai Sima, Sorin Cotofana, Stamatis Vassiliadis, Jos T.J. van Eijndhoven, "Variable-Length Decoder Implemented on a TriMedia/CPU64 Reconfigurable Functional Unit," Proceedings of the Workshop on Circuits, Systems and Signal Processing (ProRISC 2001), STW Press, Veldhoven, The Netherlands, November 2001. Mihai Sima, Sorin Cotofana, Jos T.J. van Eijndhoven, Stamatis Vassiliadis, "An 8-Point IDCT Computing Resource Implemented on a TriMedia/CPU64 Reconfigurable Functional Unit," Proceedings of the 2nd Workshop on Embedded Systems and Software (PROGRESS 2001), STW Press, Veldhoven, The Netherlands, October 2001. Mihai Sima, Stamatis Vassiliadis, Sorin Cotofana, Jos T.J. van Eijndhoven, Kees A. Vissers, "A Taxonomy of Custom Computing Machines," Proceedings of the First Workshop on Embedded Systems and Software (PROGRESS 2000), STW Press, pp. 87-93, Utrecht, The Netherlands, October 2000.